In number theory, the prime number theorem (PNT) describes the asymptotic distribution of the prime numbers among the positive integers. It formalizes the intuitive idea that primes become less common as they become larger by precisely quantifying the rate at which this occurs. The theorem was proved independently by Jacques Hadamard and Charles Jean de la Vallée Poussin in 1896 using ideas introduced by Bernhard Riemann (in particular, the Riemann zeta function). The first such distribution found is π(N) ~ N/log(N), where π(N) is the prime-counting function and log(N) is the natural logarithm of N. This means that for large enough N, the probability that a random integer not greater than N is prime is very close to 1 / log(N). Consequently, a random integer with at most 2n digits (for large enough n) is about half as likely to be prime as a random integer with at most n digits. For example, among the positive integers of at most 1000 digits, about one in 2300 is prime (log(101000) ≈ 2302.6), whereas among positive integers of at most 2000 digits, about one in 4600 is prime (log(102000) ≈ 4605.2). In other words, the average gap between consecutive prime numbers among the first N integers is roughly log(N). 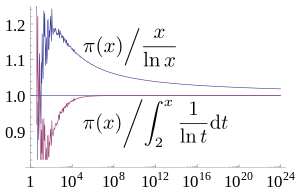 Graph showing ratio of the prime-counting function π(x) to two of its approximations, x / log x and Li(x). As x increases (note x axis is logarithmic), both ratios tend towards 1. The ratio for x / log x converges from above very slowly, while the ratio for Li(x) converges more quickly from below. Log-log plot showing absolute error of x / log x and Li(x), two approximations to the prime-counting function π(x). Unlike the ratio, the difference between π(x) and x / log x increases without bound as x increases. On the other hand, Li(x) − π(x) switches sign infinitely many times. This notation (and the theorem) does not say anything about the limit of the difference of the two functions as x increases without bound. Instead, the theorem states that x / log x approximates π(x) in the sense that the relative error of this approximation approaches 0 as x increases without bound. the asymptotic notation meaning, again, that the relative error of this approximation approaches 0 as n increases without bound. For example, the 7017200000000000000♠2×1017th prime number is 7018851267738604819♠8512677386048191063, and (7017200000000000000♠2×1017)log(7017200000000000000♠2×1017) rounds to 7018796741875229174♠7967418752291744388, a relative error of about 6.4%. where ϑ and ψ are the first and the second Chebyshev functions respectively. Distribution of primes up to 19# (7006969969000000000♠9699690). Based on the tables by Anton Felkel and Jurij Vega, Adrien-Marie Legendre conjectured in 1797 or 1798 that π(a) is approximated by the function a / (A log a + B), where A and B are unspecified constants. In the second edition of his book on number theory (1808) he then made a more precise conjecture, with A = 1 and B = −1.08366. Carl Friedrich Gauss considered the same question at age 15 or 16 "in the year 1792 or 1793", according to his own recollection in 1849. In 1838 Peter Gustav Lejeune Dirichlet came up with his own approximating function, the logarithmic integral li(x) (under the slightly different form of a series, which he communicated to Gauss). Both Legendre's and Dirichlet's formulas imply the same conjectured asymptotic equivalence of π(x) and x / log(x) stated above, although it turned out that Dirichlet's approximation is considerably better if one considers the differences instead of quotients. In two papers from 1848 and 1850, the Russian mathematician Pafnuty Chebyshev attempted to prove the asymptotic law of distribution of prime numbers. His work is notable for the use of the zeta function ζ(s), for real values of the argument "s", as in works of Leonhard Euler, as early as 1737. Chebyshev's papers predated Riemann's celebrated memoir of 1859, and he succeeded in proving a slightly weaker form of the asymptotic law, namely, that if the limit of π(x) / (x / log(x)) as x goes to infinity exists at all, then it is necessarily equal to one. He was able to prove unconditionally that this ratio is bounded above and below by two explicitly given constants near 1, for all sufficiently large x. Although Chebyshev's paper did not prove the Prime Number Theorem, his estimates for π(x) were strong enough for him to prove Bertrand's postulate that there exists a prime number between n and 2n for any integer n ≥ 2. An important paper concerning the distribution of prime numbers was Riemann's 1859 memoir "On the Number of Primes Less Than a Given Magnitude", the only paper he ever wrote on the subject. Riemann introduced new ideas into the subject, the chief of them being that the distribution of prime numbers is intimately connected with the zeros of the analytically extended Riemann zeta function of a complex variable. In particular, it is in this paper of Riemann that the idea to apply methods of complex analysis to the study of the real function π(x) originates. Extending the ideas of Riemann, two proofs of the asymptotic law of the distribution of prime numbers were obtained independently by Jacques Hadamard and Charles Jean de la Vallée Poussin and appeared in the same year (1896). Both proofs used methods from complex analysis, establishing as a main step of the proof that the Riemann zeta function ζ(s) is non-zero for all complex values of the variable s that have the form s = 1 + it with t > 0. During the 20th century, the theorem of Hadamard and de la Vallée Poussin also became known as the Prime Number Theorem. Several different proofs of it were found, including the "elementary" proofs of Atle Selberg and Paul Erdős (1949). While the original proofs of Hadamard and de la Vallée Poussin are long and elaborate, later proofs introduced various simplifications through the use of Tauberian theorems but remained difficult to digest. A short proof was discovered in 1980 by American mathematician Donald J. Newman. Newman's proof is arguably the simplest known proof of the theorem, although it is non-elementary in the sense that it uses Cauchy's integral theorem from complex analysis. holds, where the sum is over all zeros (trivial and nontrivial) of the zeta function. This striking formula is one of the so-called explicit formulas of number theory, and is already suggestive of the result we wish to prove, since the term x (claimed to be the correct asymptotic order of ψ(x)) appears on the right-hand side, followed by (presumably) lower-order asymptotic terms. which vanishes for a large x. The nontrivial zeros, namely those on the critical strip 0 ≤ Re(s) ≤ 1, can potentially be of an asymptotic order comparable to the main term x if Re(ρ) = 1, so we need to show that all zeros have real part strictly less than 1.
has a simple pole at s = 1 and ζ(x + 2iy) stays analytic, the left hand side in the previous inequality tends to 0, a contradiction. Finally, we can conclude that the PNT is heuristically true. To rigorously complete the proof there are still serious technicalities to overcome, due to the fact that the summation over zeta zeros in the explicit formula for ψ(x) does not converge absolutely but only conditionally and in a "principal value" sense. There are several ways around this problem but many of them require rather delicate complex-analytic estimates that are beyond the scope of this paper. Edwards's book provides the details. Another method is to use Ikehara's Tauberian theorem, though this theorem is itself quite hard to prove. D. J. Newman observed that the full strength of Ikehara's theorem is not needed for the prime number theorem, and one can get away with a special case that is much easier to prove. for all x ≥ 73.2. This latter bound has been shown to express a variance to mean power law (when regarded as a random function over the integers), 1/f noise and to also correspond to the Tweedie compound Poisson distribution. Parenthetically, the Tweedie distributions represent a family of scale invariant distributions that serve as foci of convergence for a generalization of the central limit theorem. In the first half of the twentieth century, some mathematicians (notably G. H. Hardy) believed that there exists a hierarchy of proof methods in mathematics depending on what sorts of numbers (integers, reals, complex) a proof requires, and that the prime number theorem (PNT) is a "deep" theorem by virtue of requiring complex analysis. This belief was somewhat shaken by a proof of the PNT based on Wiener's tauberian theorem, though this could be set aside if Wiener's theorem were deemed to have a "depth" equivalent to that of complex variable methods. for primes p. By July of that year, Selberg and Paul Erdős had each obtained elementary proofs of the PNT, both using Selberg's asymptotic formula as a starting point. These proofs effectively laid to rest the notion that the PNT was "deep", and showed that technically "elementary" methods were more powerful than had been believed to be the case. On the history of the elementary proofs of the PNT, including the Erdős–Selberg priority dispute, see an article by Dorian Goldfeld. There is some debate about the significance of Erdős and Selberg's result. There is no rigorous and widely accepted definition of the notion of elementary proof in number theory, so it is not clear exactly in what sense their proof is "elementary". Although it does not use complex analysis, it is in fact much more technical than the standard proof of PNT. One possible definition of an "elementary" proof is "one that can be carried out in first order Peano arithmetic." There are number-theoretic statements (for example, the Paris–Harrington theorem) provable using second order but not first order methods, but such theorems are rare to date. Erdős and Selberg's proof can certainly be formalized in Peano arithmetic, and in 1994, Charalambos Cornaros and Costas Dimitracopoulos proved that their proof can be formalized in a very weak fragment of PA, namely IΔ0 + exp, However, this does not address the question of whether or not the standard proof of PNT can be formalized in PA. In 2009, John Harrison employed HOL Light to formalize a proof employing complex analysis. By developing the necessary analytic machinery, including the Cauchy integral formula, Harrison was able to formalize "a direct, modern and elegant proof instead of the more involved 'elementary' Erdős–Selberg argument". where φ is Euler's totient function. In other words, the primes are distributed evenly among the residue classes [a] modulo n with gcd(a, n) = 1. This is stronger than Dirichlet's theorem on arithmetic progressions (which only states that there is an infinity of primes in each class) and can be proved using similar methods used by Newman for his proof of the prime number theorem. The Siegel–Walfisz theorem gives a good estimate for the distribution of primes in residue classes. so the lead in the race switches back and forth infinitely many times. The phenomenon that π4,3(x) is ahead most of the time is called Chebyshev's bias. The prime number race generalizes to other moduli and is the subject of much research; Pál Turán asked whether it is always the case that π(x;a,c) and π(x;b,c) change places when a and b are coprime to c. Granville and Martin give a thorough exposition and survey. 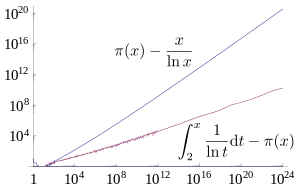 The first inequality holds for all x ≥ 599 and the second one for x ≥ 355991. Again considering the 7017200000000000000♠2×1017th prime number 7018851267738604819♠8512677386048191063, this gives an estimate of 7018851268131555471♠8512681315554715386; the first 5 digits match and relative error is about 0.00005%. The table compares exact values of π(x) to the two approximations x / log x and li(x). The last column, x / π(x), is the average prime gap below x. The value for π(1024) was originally computed assuming the Riemann hypothesis; it has since been verified unconditionally. There is an analogue of the prime number theorem that describes the "distribution" of irreducible polynomials over a finite field; the form it takes is strikingly similar to the case of the classical prime number theorem. which makes the analogy clearer. Since there are precisely qn monic polynomials of degree n (including the reducible ones), this can be rephrased as follows: if a monic polynomial of degree n is selected randomly, then the probability of it being irreducible is about 1/n. where μ(k) is the Möbius function. (This formula was known to Gauss.) The main term occurs for d = n, and it is not difficult to bound the remaining terms. The "Riemann hypothesis" statement depends on the fact that the largest proper divisor of n can be no larger than n/2. Abstract analytic number theory for information about generalizations of the theorem. Landau prime ideal theorem for a generalization to prime ideals in algebraic number fields. ^ Hoffman, Paul (1998). The Man Who Loved Only Numbers. New York: Hyperion Books. p. 227. ISBN 978-0-7868-8406-3. MR 1666054. ^ "Prime Curios! : 8512677386048191063". Prime Curios!. University of Tennessee at Martin. 2011-10-09. ^ C. F. Gauss. Werke, Bd 2, 1st ed, 444–447. Göttingen 1863. ^ Costa Pereira, N. (August–September 1985). "A Short Proof of Chebyshev's Theorem". American Mathematical Monthly. 92 (7): 494–495. doi:10.2307/2322510. JSTOR 2322510. ^ Nair, M. (February 1982). "On Chebyshev-Type Inequalities for Primes". American Mathematical Monthly. 89 (2): 126–129. doi:10.2307/2320934. JSTOR 2320934. ^ Ingham, A. E. (1990). The Distribution of Prime Numbers. Cambridge University Press. pp. 2–5. ISBN 978-0-521-39789-6. ^ Newman, Donald J. (1980). "Simple analytic proof of the prime number theorem". American Mathematical Monthly. 87 (9): 693–696. doi:10.2307/2321853. JSTOR 2321853. MR 0602825. ^ Zagier, Don (1997). "Newman's short proof of the prime number theorem". American Mathematical Monthly. 104 (8): 705–708. doi:10.2307/2975232. JSTOR 2975232. MR 1476753. ^ Edwards, Harold M. (2001). Riemann's zeta function. Courier Dover Publications. ISBN 978-0-486-41740-0. ^ Kevin Ford (2002). "Vinogradov's Integral and Bounds for the Riemann Zeta Function" (PDF). Proc. London Math. Soc. (3). 85: 565–633. doi:10.1112/S0024611502013655. ^ Tim Trudgian (February 2016). "Updating the error term in the prime number theorem". Ramanujan Journal. 39 (2): 225–234. arXiv:1401.2689. doi:10.1007/s11139-014-9656-6. ^ Von Koch, Helge (1901). "Sur la distribution des nombres premiers" [On the distribution of prime numbers]. Acta Mathematica (in French). 24 (1): 159–182. doi:10.1007/BF02403071. MR 1554926. ^ Schoenfeld, Lowell (1976). "Sharper Bounds for the Chebyshev Functions θ(x) and ψ(x). II". Mathematics of Computation. 30 (134): 337–360. doi:10.2307/2005976. JSTOR 2005976. MR 0457374. .
^ Jørgensen, Bent; Martínez, José Raúl; Tsao, Min (1994). "Asymptotic behaviour of the variance function". Scandinavian Journal of Statistics. 21 (3): 223–243. JSTOR 4616314. MR 1292637. ^ Littlewood, J. E. (1914). "Sur la distribution des nombres premiers". Comptes Rendus. 158: 1869–1872. JFM 45.0305.01. ^ a b c Goldfeld, Dorian (2004). "The elementary proof of the prime number theorem: an historical perspective" (PDF). In Chudnovsky, David; Chudnovsky, Gregory; Nathanson, Melvyn (eds.). Number theory (New York, 2003). New York: Springer-Verlag. pp. 179–192. doi:10.1007/978-1-4419-9060-0_10. ISBN 978-0-387-40655-8. MR 2044518. ^ Selberg, Atle (1949). "An Elementary Proof of the Prime-Number Theorem". Annals of Mathematics. 50 (2): 305–313. doi:10.2307/1969455. JSTOR 1969455. MR 0029410. ^ Baas, Nils A.; Skau, Christian F. (2008). "The lord of the numbers, Atle Selberg. On his life and mathematics" (PDF). Bull. Amer. Math. Soc. 45 (4): 617–649. doi:10.1090/S0273-0979-08-01223-8. MR 2434348. ^ . Cornaros, Charalambos; Dimitracopoulos, Costas (1994). "The prime number theorem and fragments of PA" (PDF). Archive for Mathematical Logic. 33 (4): 265–281. doi:10.1007/BF01270626. MR 1294272. Archived from the original (PDF) on 2011-07-21. ^ a b Avigad, Jeremy; Donnelly, Kevin; Gray, David; Raff, Paul (2008). "A formally verified proof of the prime number theorem". ACM Transactions on Computational Logic. 9 (1): 2. arXiv:cs/0509025. doi:10.1145/1297658.1297660. MR 2371488. ^ Harrison, John (2009). "Formalizing an analytic proof of the Prime Number Theorem". Journal of Automated Reasoning. 43 (3): 243–261. CiteSeerX 10.1.1.646.9725. doi:10.1007/s10817-009-9145-6. MR 2544285. ^ Soprounov, Ivan (1998). "A short proof of the Prime Number Theorem for arithmetic progressions" (PDF). ^ a b c Granville, Andrew; Martin, Greg (2006). "Prime Number Races" (PDF). American Mathematical Monthly. 113 (1): 1–33. doi:10.2307/27641834. JSTOR 27641834. MR 2202918. ^ Guy, Richard K. (2004). Unsolved problems in number theory (3rd ed.). Springer-Verlag. A4. ISBN 978-0-387-20860-2. Zbl 1058.11001. ^ Dusart, Pierre (1998). Autour de la fonction qui compte le nombre de nombres premiers (PhD thesis) (in French). ^ Rosser, Barkley (1941). "Explicit Bounds for Some Functions of Prime Numbers". American Journal of Mathematics. 63 (1): 211–232. doi:10.2307/2371291. JSTOR 2371291. MR 0003018. ^ Dusart, Pierre (2010). "Estimates of Some Functions Over Primes without R.H". arXiv:1002.0442 [math.NT]. ^ Cesàro, Ernesto (1894). "Sur une formule empirique de M. Pervouchine". Comptes Rendus Hebdomadaires des Séances de l'Académie des Sciences (in French). 119: 848–849. ^ Rosser, Barkley (1941). "Explicit bounds for some functions of prime numbers". American Journal of Mathematics. 63 (1): 211–232. doi:10.2307/2371291. JSTOR 2371291. ^ Dusart, Pierre (1999). "The kth prime is greater than k(log k + log log k−1) for k ≥ 2". Mathematics of Computation. 68 (225): 411–415. doi:10.1090/S0025-5718-99-01037-6. MR 1620223. ^ "Conditional Calculation of π(1024)". Chris K. Caldwell. Retrieved 2010-08-03. ^ Platt, David (2015). "Computing π(x) analytically". Mathematics of Computation. 84 (293): 1521–1535. arXiv:1203.5712. doi:10.1090/S0025-5718-2014-02884-6. MR 3315519. ^ Chebolu, Sunil; Mináč, Ján (December 2011). "Counting Irreducible Polynomials over Finite Fields Using the Inclusion π Exclusion Principle". Mathematics Magazine. 84 (5): 369–371. arXiv:1001.0409. doi:10.4169/math.mag.84.5.369. JSTOR 10.4169/math.mag.84.5.369. Hardy, G. H.; Littlewood, J. E. (1916). "Contributions to the Theory of the Riemann Zeta-Function and the Theory of the Distribution of Primes". Acta Mathematica. 41: 119–196. doi:10.1007/BF02422942. Granville, Andrew (1995). "Harald Cramér and the distribution of prime numbers" (PDF). Scandinavian Actuarial Journal. 1: 12–28. CiteSeerX 10.1.1.129.6847. doi:10.1080/03461238.1995.10413946. Table of Primes by Anton Felkel. Short video visualizing the Prime Number Theorem. Prime formulas and Prime number theorem at MathWorld. How Many Primes Are There? and The Gaps between Primes by Chris Caldwell, University of Tennessee at Martin.